Watch this space for a primer on Recovery. Side Trips From Cowboy is a personal exploration of the Nez Perce story and the American West coupled with a intimate look at the nature of addiction. Anyone who is, loves or has a friend who’s an addict — and that’s nearly all of us — might benefit from this book. Follow a blue Chevy pickup with license plates that read ADVNTUR as it carries author Sandy Compton and friends across the West in the tracks of the Nez Perce who suffered the war of 1877. They are looking for ghosts and find not a few — in wild, excruciatingly beautiful country. 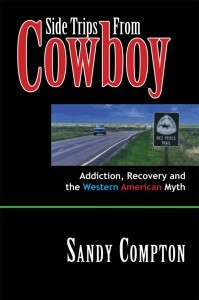 Braided into this tale is the author’s lifelong search for Cowboy, his fight with addiction — a disease he dubs growupus interruptus — and his path through the 12 Steps of Recovery. He finds this path isn’t always — or often — easy. But it’s a damned sight better than the alternatives — death, prison or insanity. Side Trips From Cowboy is an adventure that explores wilderness — wild places both within and outside of us — and leads to startling, not-so-easy, yet somehow comforting revelations about the nature of addiction and recovery. You’re invited along on this adventure to learn this path and consider what you really want to be when you grow up. This book was made from Mariam Lawton Clayton’s hand-written account and pages of “kodacs” of her honeymoon trip with her new husband Earl to western Wyoming and Yellowstone National Park in the year 1910. It is a fine record of an adventure of great proportions undertaken at the cusp of modern times; a journey that, were it attempted today, might be accompanied by a support van, cell phones, contingent emergency procedures, months of planning and pounds and pounds of freeze-dried food. But, to use her own words, Mariam and Earl simply “ … loaded camp-kit and grub-box also a limited supply of clothing and started. We had no definite idea of distance or trail, but we planned to live in the open and take what came.” When she wrote it she didn’t know that one day she and her family would move away from Kansas and to what she called the “great Columbia River basin.” But this trip was what gave Mariam and Earl the kernel of thought that would lead them to Montana and Blue Creek on Clark’s Fork of the Columbia six and a half years after they began in July of 1910 from Rock Springs, Wyoming for “our brother’s cabin” in Boulder and the adventure of a lifetime.